How do you make up your mind about dinner when the weather won’t make up its mind? In the 60’s, well that almost seems like salad weather in February. Oh wait, a couple hours later it’s pouring rain and 35°? Ok, now I want some hot comfort food. Throw these ingredients into the slow cooker and a comfort meal you will have, in 4 to 5 hours. Wait, as I type this, the rain has turned to snow. Ok. I give up. I know I can’t go wrong with caraway seeds, whole grain mustard and Nuremberg sausage! 🙂 Hearty and yum. In a 4 to 6 quart slow cooker, combine the cabbage, onions, caraway and mustard seeds, salt and old bay. Toss with hands. 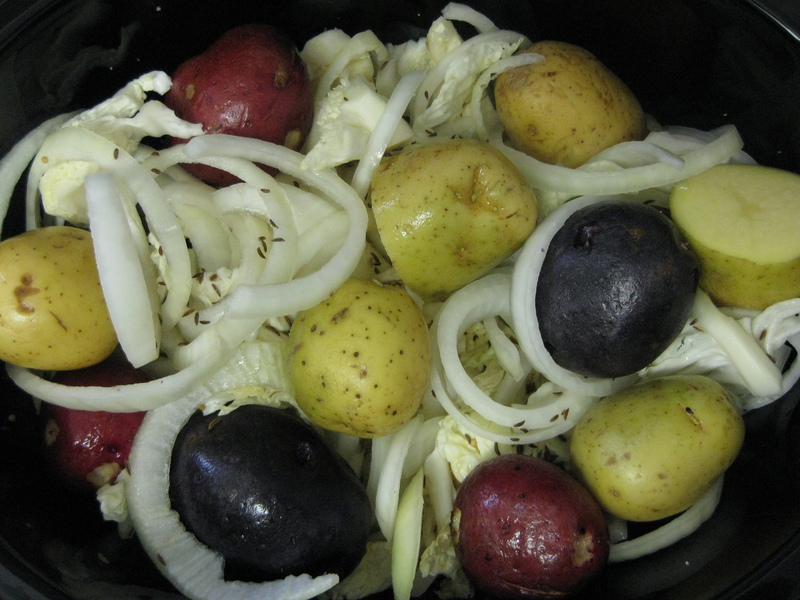 Pour in the broth and vinegar and then nestle the potatoes into the cabbage mix. If your sausages are not pre-cooked, you can add them now. If the sausage is pre-cooked, add it in after 2 hours cooking has elapsed. Cook for 4 to 5 hours on high. *Note: As it cooks, the cabbage will wilt and reduce in size, releasing a bit of water, so don’t add more than 1 cup liquid at the start. If it drys out, then you can add more. 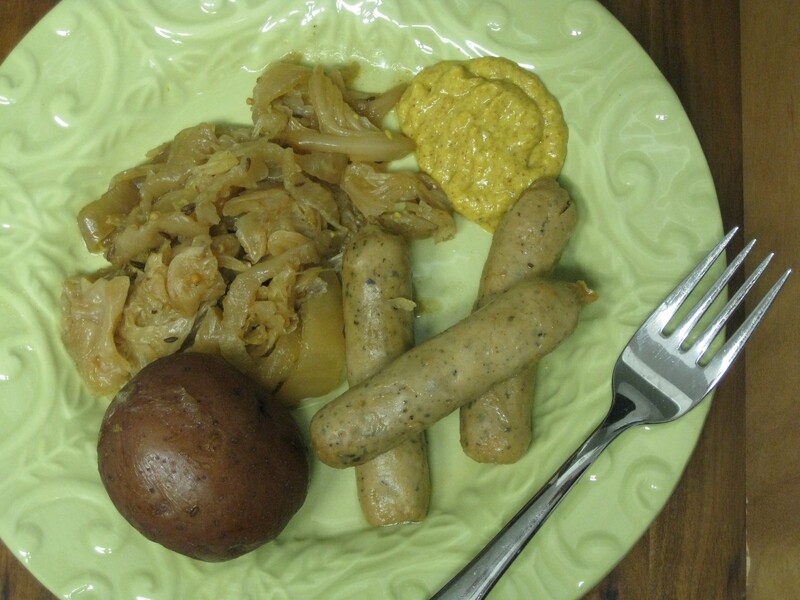 This entry was posted in dinner recipes, ethnic and tagged cooking, easy dinners, food, German, recipes, slow cooker. Bookmark the permalink.